After almost three months since long hours were spent in a hot, stuffy classroom, our minds have wandered far away from school work. For some, getting back into the groove is a smooth transition; there are those of us who crave schedules, learning, and the social environment provided by school. However, the majority of students may drag their feet into school like Charlie Brown or Eeyore in an emotional slump. It is completely normal to feel this way, as most of us are not expecting smooth sailing into our next year of the rigorous curriculum, challenging assignments and ruthless tests. Really though, it is the anticipation of the transition that is actually harder than the start of school itself. Once we walk through the doors of High School East, it always feels like we never left. Hugging and high-fiving friends that we may not have seen all summer as well as smiling at faculty and meeting new teachers help to shift our minds immediately into school mode. Rather than complaining about waking up at 6:00 am, we are immersed into scanning our classrooms for familiar faces, rushing to get across from Social Studies to Spanish class, and forgetting that just last week we were moaning over the last beach day with our friends or families. 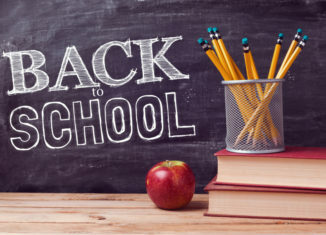 The truth is that we are not alone and everyone feels a bit of sadness and stress, along with some trepidation, including the teachers, about starting the new school year. It’s really not all that bad- school means enriching our minds, working with others, and preparing us for our futures. There is something good about getting back into a routine. Research proves that having a scheduled day provides benefits that include better mental health, good habit formation, and the need to be more efficient. Endless days full of too much time turn into days filled with discipline and education. As students, we simply have the choice of the effort and time we put forth into our work, and our outcomes can be very rewarding. These four years in high school prepare us for our futures. We may moan over assignments, studying for multiple tests on one day, or feel like we have no time to ourselves, however, we are engaging in a quality experience that will help us become college students, cooperative citizens, and active members of society. For some, this year may provide opportunities to form new study habits and tackle obstacles that seemed unreachable in the past. If we consider our attendance at Half Hollow Hills High School East to be a privilege to an education that shapes our future, we may not see it through the negative back to school lens. This may be the year that you connect with a teacher or mentor, make an amazing new friend in class or achieve a goal that you have been aiming for. Whatever the 2018-2019 school year has in store for you, take advantage of your educational experience and good luck in your endeavors!